Paper maps had some real drawbacks -- they make a lot of noise when you open and fold them, they wear out rapidly, and if they get wet, they turn into mush. Someone in MI-5 (similar to America 's OSS ) got the idea of printing escape maps on silk. It 's durable, can be scrunched-up into tiny wads, and unfolded as many times as needed, and makes no noise whatsoever. At that time, there was only one manufacturer in Great Britain that had perfected the technology of printing on silk, and that was John Waddington, Ltd. When approached by the government, the firm was only too happy to do its bit for the war effort. British and American air crews were advised, before taking off on their first mission, how to identify a 'rigged' Monopoly set; by means of a tiny red dot, one cleverly rigged to look like an ordinary printing glitch, located in the corner of the "Free Parking" square. Of the estimated 35,000 Allied POWS who successfully escaped, an estimated one-third were aided in their flight by the rigged Monopoly sets. Everyone who did so was sworn to secrecy indefinitely, since the British Government might want to use this highly successful ruse in still another, future war. The story wasn't de-classified until 2007, when the surviving craftsmen from Waddington's, as-well-as the firm itself, were finally honored in a public ceremony. Anyway, it's always nice when you can play that 'Get Out of Jail Free' card. Most of our visitors are too young to remember WWII, but this is still interesting. 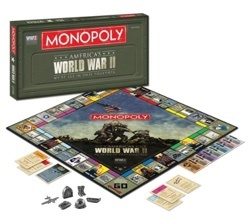 There is now a World War II Monopoly Game, see below. 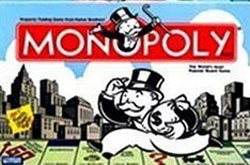 "MONOPOLY TM: America's World War II: We're All In This Together Edition Honor! Courage! Victory! Honor the brave men and women who faced the global spread of tyranny when you play America's World War II: We're All In This Together, a World War II Edition of America's favorite game, MONOPOLY TM! Wheel and deal World War II events such as Pearl Harbor, D-Day Normandy and Battle of the Bulge in an effort to own these momentous pieces of history. Build support and rally the troops as you establish Camps and Headquarters on your way to victory! Includes 6 custom tokens: B-17 Bomber, Boot, Cathedral Radio, LCVP, Sherman Tank, American Helmet AGES 8+ 2-6 players.